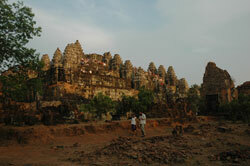 The construction of this temple mountain on Phnom Bakheng (Bakheng Hill), the first major temple to be constructed in the Angkor area, marked the move of the capital of the Khmer empire from Roluos to Angkor in the late 9th century AD. 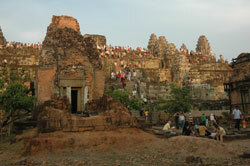 It served as King Yasovarman I's state-temple at the center of his new capital city Yasodharapura. The foundation of Bakheng is carved from the existing rock edifice rather than the laterite and earthfill of most other temples. Bakheng's hilltop location makes it the most popular sunset location in the area, offering a view of the Tonle Sap Lake and a distant Angkor Wat Temple in the jungle. 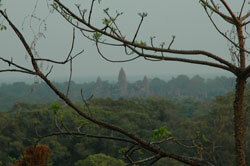 (A good photo of Angkor Wat in the distance requires at least a 400mm lens.) 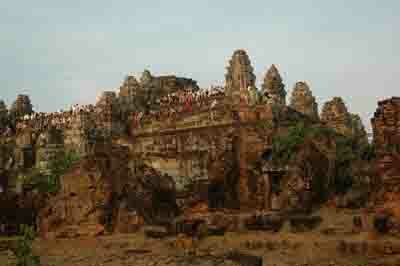 The temple is usually overcrowded at sunset, sometimes even completely overrun by tourists. Due to overuse and damage, the main stairway up the mountain has been closed and an alternate path to the top has been opened. 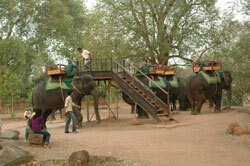 Elephant Ride sup and down the hill are also available from about 4:00PM till sunset. $15/person up the mountain. $10 per person down the mountain. Elephants waiting for customers to take back down the hill.